Warning: This post contains spoilers for the TV series Orange Is the New Black. If you haven't watched seasons 1 and 2 and don't want them ruined for you, turn back now. The main thing I can say about this book is that it's not terribly similar to the hit Netflix series with the same title. There are certainly some parts that are recognizable, but it's clear the writers of the show have elaborated, adjusted details, or flat-out invented some elements to make the story salacious enough to be good television. And that's fine—I watch the show because it's compelling. It's a setting I don't have personal experience with (and hope to stay far, far away from) and it's full of characters that are alternately endearing and infuriating. The show is designed to provoke a strong reaction, and it does. It's no skin off my nose if they don't closely follow the actual events of Piper's imprisonment as they happened in real life. However, if you start reading expecting the book to mirror the show's level of drama, you're set up for some disappointment. Kerman's narrative is fluidly written and plenty interesting, but there's a lot less interpersonal drama than the show delivers. In fact, Kerman pretty much got along with her fellow prisoners. She never lost her mind with rage and beat Pennsatucky to a pulp. The kitchen manager didn't withhold food from her to punish her for insulting remarks. She never got sent to the SHU, though she knew other prisoners who did. And the incident with Crazy Eyes revenge-peeing on the floor in the middle of the night? Yeah, that happened to someone else and Kerman was a witness, not the target. And perhaps most surprising, considering how much mileage the show got out of the situation, Kerman didn't reunite with her ex-girlfriend in prison and cheat on her fiance with her. The point of the book is less about titillation than promoting prison reform. Kerman clearly has an agenda, mixing statistics and data into the story, sometimes without particular finesse. I don't necessarily disagree, especially with her insistence that recidivism is high because prisoners are not prepared to look for housing and jobs upon release. But it makes for a much more serious, heavy read than you might think if your only frame of reference is the show. So I do recommend this book, but I suspect your enjoyment will be greater if you think of it as a companion of sorts to the Netflix series, and not as a literary version of the same story. 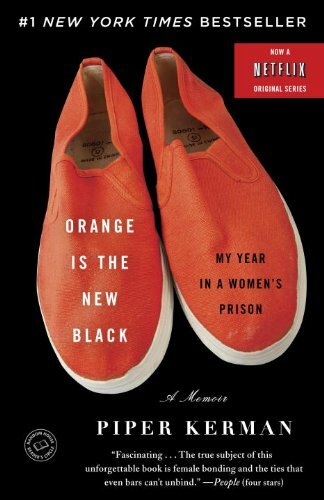 If watching OITNB has sparked your curiosity regarding prison life, reading the book will give you a more complete picture of Kerman's experience. If you're just looking for a firsthand account of girl-on-girl in the prison showers, keep moving.